CannabisNewsWire Editorial Coverage: Leveraging ever-expanding scientific evidence of the therapeutic efficacy of CBD (cannabidiol), specialty biotechnology companies are creating novel new formulations of the chemical compound to capitalize on the titanic growth expected in the cannabis-derived pharmaceutical and nutraceutical markets. Cannabinoids have been used for medicinal purposes for millennia, but it wasn’t until the discovery of the human endocannabinoid system in the 1990s that scientists began to comprehend their importance in healing and homeostasis. The identification of human cannabinoid receptors opened the floodgates to new cannabis-based medications. Increased understanding of the endocannabinoid system sparked further scientific research and led to the realization that cannabinoids impact a much wider range of physiological functions than previously realized. Specialty biotechnology companies soon blossomed and now these companies research and develop wide-ranging novel new drug candidates to improve and extend patients’ lives, creating unique medicines to treat multiple maladies and answer unmet medical needs. These pioneering biotech companies are committed to developing cannabis-based pharmaceuticals and nutraceuticals delivered with unparalleled safety and new-found efficacy. At the vanguard of this surge in cannabinoid therapeutics, Earth Science Tech, Inc. (OTC: ETST) (ETST Profile) has taken another major step in its mission to become a global leader in the research, development and sale of hemp-derived, CBD–based pharmaceuticals, nutraceuticals and dietary supplements. The company’s recent decision to uplist on the OTCQB exchange will likely increase visibility and liquidity, and its comprehensive strategy of scientific development combined with robust retail creates a unique opportunity in the burgeoning medical cannabis markets. Other companies vying for position in these lucrative markets include CV Sciences, Inc. (OTC: CVSI), Axim Biotechnologies, Inc. (OTC: AXIM), GB Sciences, Inc. (OTC: GBLX) and Vitality Biopharma (OTC: VBIO). Little wonder that cannabis biotech companies are operating at full throttle. The global medical marijuana market is anticipated to exceed $55 billion by 2025 and, to meet increasing consumer demand, hemp-based nutraceuticals are rapidly gaining significant traction in a global nutraceuticals market projected to surpass $319 billion within the next five years. These eye-popping projections bode well for diversified cannabis biotech companies. CBD pharmaceuticals and nutraceuticals are the fastest growing sectors in the legal cannabis markets and the sector itself is among the fastest growing in all the markets. With multiple clinical research studies suggesting that CBD based pharmaceuticals and nutraceuticals have the potential to treat arthritis, MS, chronic pain, depression, epilepsy and a myriad of other illnesses and maladies, the prodigious market projections might even be underestimated. Seizing on the immense market opportunity and validating efficacy through scientific processes, Earth Science Tech, Inc. (OTC: ETST) is intent on becoming a global leader in the research, development and sale of hemp-derived, CBD-based pharmaceuticals, nutraceuticals and dietary supplements. The company has racked up a succession of achievements since inception and its latest announcement establishes another milestone in its march toward global recognition. The company just issued a press release confirming that the U.S. Securities and Exchange Commission (SEC) approved the company’s Form 10 Registration Statement and Earth Sciences has officially up-listed to an OTCQB fully reporting company as of Sept. 10. The higher standards of the OTCQB markets provide a strong baseline for transparency, as well as the technology and regulations to enhance both access to information and trading experiences for investors. “Historically, up-listing to the OTCQB and being fully reporting has resulted in greater liquidity and awareness. We are committed to the higher level of corporate and financial disclosures required as an OTCQB fully reporting company, demonstrating our commitment to our loyal shareholders,” stated ETST’s President, Director and Chairman Nickolas S. Tabraue. Grounded in science, ETST still understands that sales are essential for continued success. Earth Science aggressively markets and sells the highest-available quality and purity full spectrum hemp oil containing CBD. The company’s products are formulated using superior supercritical CO2 cold liquid extraction, where the cannabinoids are kept at the rawest state possible to maintain essential therapeutic properties. Earth Science’s CBD products are marketed through multiple venues including a national group of independent distributors representing grocery and convenience stores, a national association of buying groups and trade organizations reaching up to 90,000 retail outlets, health food giant Karmavore Superfoods, international supplement distributor Forzagen, innumerable vape and e-liquid smoke shops, and online. Cannabis Therapeutics, Inc., (CTI) is developing an array of cannabinoid-based pharmaceuticals and nutraceuticals. Kannabidioid, Inc., manufactures and distributes vapes/e-liquids and gummy edibles to vape and smoke shops. Earth Science Pharmaceutical, Inc., (ESP) manufactures low-cost medical devices and vaccines for protection against sexually-transmitted infections. Earth Science Foundation, Inc., a nonprofit organization formed to accept grants and donations to conduct further studies and help donate CBD products to those in need. Cannabis Therapeutics is deeply invested in research and development to explore and harness the medicinal power of cannabidiol. Over 113 cannabinoids have been isolated from the cannabis plant, many obscure and only in trace amounts, but CBD, for which Cannabis Therapeutics has a provisional application patent, is the most promising of all. CTI’s mission is to develop proprietary cannabinoid-based nutraceuticals and pharmaceutical products using Earth Science Tech’s existing cannabis CBD patent and IP, as well as expected future technologies. The company recently updated its report on research progress on two new cannabinoid-based pharmaceutical drugs, which are unique CBD formulated products – a neuron protector and a breast protector. Earlier studies by DV Biologics, a leading biological company, confirmed ETST high-grade hemp CBD oil deterred the formation of reactive oxygen species and cell death in human brain cells in vitro and may serve as a neuroprotectant to mitigate neurodegenerative disorders such as Alzheimer’s and Parkinson’s. With strong initial evidence that CBD contains anti-breast cancer properties, Earth Sciences also launched the development of proprietary prophylactic therapies to prevent breast cancer, and a treatment to help women with aggressive breast cancer. The company is very bullish on these CBD formulas. The R&D work in progress at the prestigious laboratory, Centre De Développement Bioalimentaire Du Québec (CDBQ), has been exceptionally promising. CDBQ is highly experienced and able to utilize the most effective and economical solutions to develop products with the best efficacy and price-to-quality-to-market ratios. CDBQ is meticulously finalizing formulations that will include natural protective agents to assure long shelf life of the CBD formula. The third CBD formula is a revolutionary superfood with unique organoleptic properties never seen on the market. Formulated from a mix of hemp oil and other vegetal oils, and enriched with a highly potent antioxidant, this product is designed to improve antioxidant ingestion. Earth Science developed this novel formula in collaboration with experts that successfully developed multiple products for some of the largest players in the food industry. 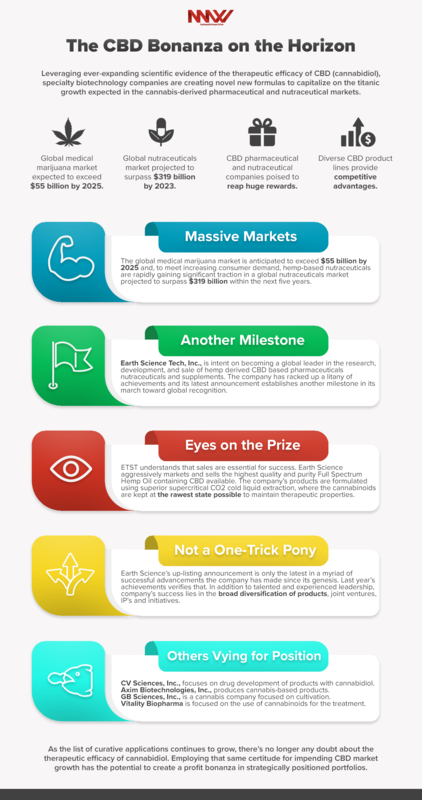 Earth Science’s up-listing announcement is only the latest in a succession of successful advancements the company has made since its genesis. Last year’s achievements verify that. In addition to talented and experienced leadership, the company’s success lies in the broad diversification of products, joint ventures, IPs and initiatives. Beyond the company’s multiple CBD-based initiatives and ventures, Earth Science’s medical device subsidiary Earth Science Pharmaceutical is making significant strides in the development of low-cost, noninvasive diagnostic tools, medical devices, testing processes and vaccines for sexually transmitted infections and/or diseases. The company’s first medical device, MSN-2, is a home kit designed for the detection of STIs, such as chlamydia, from a self-obtained gynecological specimen. ESP is working to develop and bring to market medical devices and vaccines that meet the specific needs of women. CV Sciences, Inc. (OTC: CVSI) focuses on the drug development, marketing and sale of products containing cannabidiol as the active pharmaceutical ingredient, and is engaged in the sale of CBD as well. The company operates two distinct business segments: a drug development division focused on developing and commercializing novel therapeutics utilizing synthetic CBD; and a consumer product division centered in the manufacturing, marketing and sale of plant-based CBD products to a range of market sectors. Axim Biotechnologies, Inc. (OTC: AXIM) researches, develops and produces cannabis-based pharmaceutical, nutraceutical and cosmetic products. The company has several products developed or in developmental stage for the treatment and/or prevention of multiple conditions and symptoms. Axim’s flagship products include a CBD-based, controlled-release chewing gum, another gum containing 50 mg of CBD undergoing clinical trials in patients with irritable bowel syndrome, and a combination CBD/tetrahydrocannabinol (THC) gum that will undergo clinical trials for the treatment of pain and spasticity associated with MS.
GB Sciences, Inc. (OTC: GBLX) is a diverse cannabis company focused on standardized cultivation and production methods, as well as biopharmaceutical research and development. The company’s goal is to create safe, standardized, pharmaceutical-grade cannabinoid therapies that target a variety of medical conditions. Company growth strategy is two-pronged — biomedical research for the development of cannabis-based therapies and the recreational market for cannabis in Nevada. Vitality Biopharma (OTC: VBIO) is focused on the use of cannabinoids for the treatment of serious neurological and inflammatory disorders. The company has developed cannabinoid prodrugs, known as cannabosides, which upon ingestion may enable selective delivery of THC and CBD to the gastrointestinal tract. Vitality has filed intellectual property applications and is seeking global patent protection for prodrugs of THC, CB, and CBDV, as well as for its proprietary prodrug biosynthesis platform utilizing enzymatic glycosylation. As the list of curative applications continues to grow, there’s no longer any doubt about the therapeutic efficacy of cannabidiol. Employing that same certitude for impending CBD market growth has the potential to create a profit bonanza in strategically positioned portfolios.